The Newport Arboretum, Arboretum at Salve Regina, and Newport Mansions Arboretum invite city residents to join an awareness campaign by lighting their iconic beech trees. Newport residents with European beech trees on their properties are encouraged to illuminate them with special laser lighting as part of a citywide campaign next month to raise awareness about Newport’s iconic, yet aging, forest heritage. The goal of this initiative is to illuminate 100 of these trees across the city from April 14-29 to project a poignant light on the need to revitalize the city’s urban forest that is suffering significant losses in its population of century-plus-old trees. “This very special tree lighting is being undertaken to raise awareness about the peril facing our aging Gilded Age forest. We think this is a wonderful way to celebrate our amazing trees, and to join together in reminding our entire community that this incredible part of our natural heritage greatly needs our attention,” said Jennifer Garlick, Program Manager. Newport Arboretum will kick off the first night of the Lighting of the Beeches with a ceremonial public event, the “First Light Funeral,” to be held at 7pm on Thursday, April 14 on the Newport Art Museum lawn. During the celebration, the art museum’s iconic 180-year-old Fernleaf beech, which is succumbing to age and is scheduled for removal later this year, will be honored with a special illumination designed by FabNewport. The event to honor this tree will be a celebratory evening of dance, food, drink and music, all in honor of the passing of this iconic tree. To help city residents illuminate their own beech trees, the Newport Arboretum through the sponsorship of National Grid is offering laser projection lighting for loan or purchase, and the Newport Ace Hardware store will have lights available to purchase at cost. 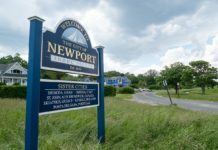 The public lighting on April 14 will kick off Newport Arboretum Week (April 22-29), a celebration that will include public plantings, trolley and walking tours, expert talks, children’s activities, a movie screening and more. The efforts culminate with an Arbor Day Celebration at the Rhode Island State House on April 29 featuring the public launch of RhodyTrees.org, an interactive digital map hosted by the Newport Arboretum that serves as a statewide urban tree register. Newport is the first city in the United States with three professionally accredited arboreta – The Newport Arboretum, The Newport Mansions Arboretum and The Arboretum at Salve Regina University. For more information on Newport Arboretum Week events, visit newportarboretumweek.org. Click on “Lighting of the Beeches” to access information about acquiring and installing laser lighting.